When you hear “yellowjacket,” what’s the first thing that comes to mind? A buzzing, stinging insect ruining your outdoor meal or a treasured pollinator of many plants? A yellowjacket is both! The most commonly found yellowjacket is the Eastern yellowjacket (Vespula maculifrons). The Eastern yellowjacket is a wasp that is 1/2 to 5/8 inch long and is black and yellow striped. The body is curved under and is wider than the head. Yellowjackets do not have any “hairs” such as are found on honeybees and bumblebees. Yellowjackets are generally ground nesters, however, in some situations, especially in urban areas, they will make their nest above ground such as in hollow walls and attics. During the spring and summer, the colony population increases from the fertilized solitary queen, who survived the winter, to several thousand. Adult yellowjackets feed protein to the young wasps and larvae while they subsist on sugars. Foraging for food, the wasps cross-pollinate plants while seeking small insects and nectar. Yellowjackets provide a valuable service to humans by consuming numerous insects that eat ornamental and cultivated plants. On the other hand, yellowjackets are drawn to cookouts, picnic areas and garbage cans. Their sting, unfortunately, is especially painful. Unlike honeybees, which only sting once, wasps can sting numerous times. Some people react severely to the venom and may have problems breathing or other dangerous reactions. Don’t leave moist pet food outside during the summer. Bird seed is fine, but not suet. Keep garbage cans washed. Securely cover all garbage cans and recycling containers. Rinse beer, wine, soft drink and ice cream containers before disposing of them. Keep garbage cans away from entertainment areas, play areas and pathways. If eating outdoors, cover all serving plates and drinking glasses/bottles to prevent yellowjackets from getting into food or drink. 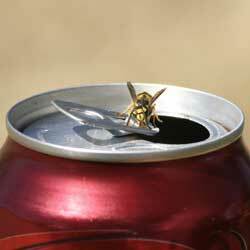 When yellowjackets are in the area, be sure to check your food and drink before consuming. Yellowjackets feed on aphids and scale on trees and shrubs. Therefore, spray for these pests in July and August, if needed, to remove that food source. Repair dripping hoses and faucets as the puddles can attract wasps. Wasps enjoy rotting fruit. Harvest tree and cane fruits when ripe. Carefully pick up all fallen fruit (gloves are a good idea!) and dispose of it in a covered container. Wasps create a flight-path from the nest to food sources. Avoid this area. If this is not possible, consider removing the nest. 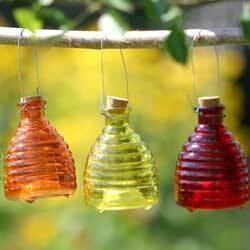 To help make your outdoor gatherings more pleasant and safer, yellowjacket traps can be effective. Hang these around the perimeter of your yard if you plan to eat outside, but never hang traps near the food area, as you will only increase the attraction to that area. Some traps are disposable and have the benefit of reducing the sting possibility. Others are “reusable” and must be emptied and refilled with bait. These increase the probability of being stung but can be more affordable in the long term. When absolutely necessary, the elimination of a yellowjacket nest should not be undertaken lightly. If it’s early in the season and the nest is visible, a forceful water blast will break it apart. To reduce the chances of being stung, do this during the day while the workers are not home. Wasps return to the colony as dusk. Sometimes the workers will begin rebuilding in the same place. 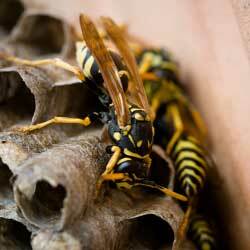 Pesticide sprays can kill wasps, and after the nest is destroyed, spraying the area can discourage rebuilding. If it’s later in the season, the aerial nest may be too large to eliminate safely. Underground nests are a much bigger challenge to destroy. Because the entrance may be at an angle to the nest, flooding seldom works. Never try to burn a yellowjacket ground nest by pouring kerosene or other flammable liquid into the entrance and lighting it. In addition to many stings, more serious injuries may occur. This also pollutes the soil and a fire can quickly get out of control. If the flight pattern to the entrance creates a serious hardship or is close to a building, it is best to consult with an expert for safe nest elimination. If the yellowjackets have built their colonies within your house walls or attic, it may also be necessary to contact a professional. Note: if yellowjackets are nesting in your home, do not plug the entrance/exit hole or they may chew the rest of the way into your house! Our experts can offer a professional referral for local wasp removal services or search “Pest Control” for your city on the Internet or in the yellow pages. Yellowjackets do have their uses, but if you have no use for these stinging insects, there are many ways to eliminate them safely. Using several techniques will be most effective and will minimize the risk of being troubled by wasps again.